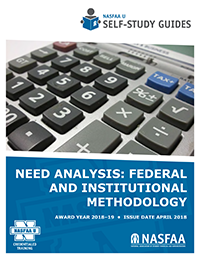 This Self-Study Guide reviews the calculation of a student's expected family contribution (EFC), and includes a discussion of the regular and simplified formulas as well as recalculations. Bonus material: Included with this Guide is an optional lesson on institutional methodology, developed in collaboration with the College Board. Understand the underlying principles of need analysis. Learn the steps used to calculate the EFC using the regular formula. Understand the eligibility criteria for the Simplified Needs Test. Learn approaches for calculating the EFC for summer periods of enrollment.